NEW PLAYERS ONLY, MINIMUM DEPOSIT £20, WAGERING REQUIREMENT ZOX BONUS AND DEPOSIT, TERMS AND CONDITIONS APPLY. All our partner sites are independently reviewed by our team of industry experts. We examine 10 different criteria and award a score out of 10 for each, adding up to a final mark out of 100. You can read a full description of our Mansion Casino review process here. Mansion Casino received a score of 83/100. Mansion Casino is owned by the Mansion Group, a Gibraltar-based online casino management company that has existed since 2003. They also operate another popular and well trusted UK site, Casino.com. Whilst Mansion lack the heavy-weight punch and sheer ubiquity of some of the tier 1 big boys in the casino market, the Mansion brand has nevertheless grown in prominence in recent years, largely due to a succession of high-profile Premier League football club sponsorship deals. First in 2006, they sponsored Tottenham Hotspur, and more recently, in 2015 the Mansion Casino name was emblazoned on the shirts of Crystal Palace and newly promoted AFC Bournemouth’s players. Mansion have been partnered with gambling software giants Playtech for many years now, and a wealth of experience in casino products and customer management means the Mansion Casino site and games portfolio has loads to offer – with a fine suite of slots, blackjack, roulette, poker and craps alongside a nice live casino. 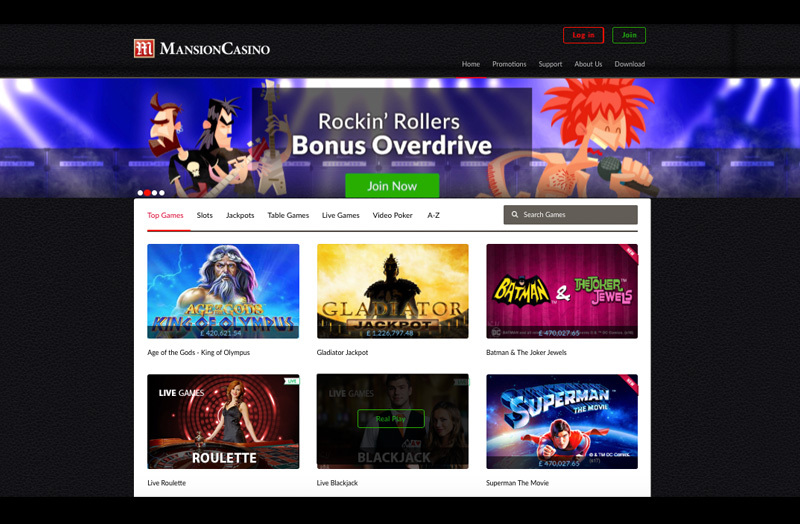 For new players and seasoned pros alike there is a lot to like in Mansion Casino, all packaged in a classy brand, and delivered by a trusted and well-established name in the industry. A great casino is evident from the manner it treats its guests. At Mansion Casino, customers, both new and existing, come first! The Welcome Bonus here is up to £5,000. The offers are available in a choice of two packages;: Double Your Money Welcome Bonus for your average spenders, and the High Roller Bonus meant for seasoned gamers who do not shy away from giving it all they have! Modest players who prefer little but manageable deposits get 100% match up on their deposits up to £500. For instance, if you put in £250, you get an extra £250, giving you £500 gaming money in total. However, big spenders who would rather build a formidable war chest to spend, get the High Roller Welcome Bonus, which gives an extra 50% up to £5000. This promotion applies to players who deposit £1,000, or more. For instance, a deposit of £3,000 will give you a total of £4,500 to play with on the many exciting games the casino has to offer. Rockin' Rollers – Every time you play at the casino, you rack up points and, each time you reach or surpass your target, which means smashing the record attained in the previous session, you earn points. You can then convert the points into bonuses. For instance, 20 points will get you 50% bonus up to £100 while 600 points will earn you £50 bonus. Red or Black – Every Wednesday, the casino gives players a chance to either double their money or cut their wagers in half. If you go with RED, you get 100% extra up to £400 while wagering 40 times, while BLACK gives you 50% extra up to £400 with a wagering requirement of 20 times. Make Your Match – Every beginning of the month, the casino gives you a chance of doubling your deposit up to £500 if you use the bonus code FIRST1. Refer a Friend – The casino has great games and a delightful gaming environment and you can tell your friends all about it. That, however, is just half the fun. For every friend you refer, the casino rewards you with a £50 bonus. Mansion Casino is a site for every gambler, offering games traversing all the casino genres. It features games from Playtech, which is a leading gaming software brand with one of the widest variety of games. The casino also provides a decent number of titles from Betsoft. Players that love slot machine games have a lot to look forward to including exciting titles such as Kong: The Eighth Wonder of the World, The Winnings of Oz and Bounty of the Beanstalk. A good many of the slot games available are progressives so players looking for huge jackpot winnings need not look anywhere else. Their portfolio of other games is just as wide. Fans of table games and other classic casino games will obviously be happy here. Mansion Casino is supported by Playtech software and offers a live dealer suite with a large array of games, including Baccarat, two variants of Blackjack, and four verisons of Roulette, as well as live Casino Hold’em. The Mansion Group is an experienced online gaming company and the Mansion Casino website shows this. Players can access the casino games from the wholly instant-play mode or they can download the casino client onto their PC and play away. Mansion Casino has an easy-to-navigate website with a professional site map. So all in, everybody will have an easy time playing here! Mansion is available on all devices – from desktop browsers to mobile and table. It is also available in both instant play and download form. Mansion Casino accepts deposits and processes withdrawal requests to a number of conventional and convenient payment methods. These include several card options such as Visa, MasterCard, and Maestro as well as e-wallets such as PayPal, Neteller, Skrill, EcoPayz, and WebMoney. It also accepts a host of bank transfer options such as Sofort, iDeal, InstaDebit and, Boku, which is a Pay by Phone Bill option. Transactions may take up to 7 days to process and, the casino imposes a monthly withdrawal ceiling, which stands at £15,000. Mansion Casino has a team of responsive and knowledgeable customer support personnel that is available round the clock via phone, email and live chat. Mansion Casino holds two gambling licenses: one issued by the Gibraltar Gambling Commissioner and one by the United Kingdom Gambling Commission. The latter regulates gambling operations that target residents of the UK.